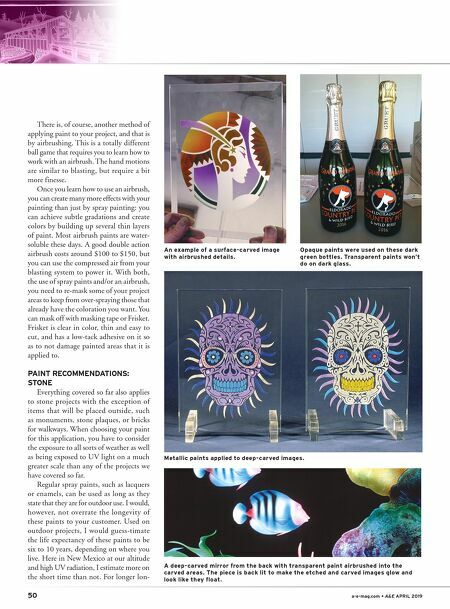 50 a-e-mag.com • A&E APRIL 2019 There is, of course, another method of applying paint to your project, and that is by airbrushing. This is a totally different ball game that requires you to learn how to work with an airbrush. The hand motions are similar to blasting, but require a bit more finesse. Once you learn how to use an airbrush, you can create many more effects with your painting than just by spray painting: you can achieve subtle gradations and create colors by building up several thin layers of paint. Most airbrush paints are water- soluble these days. A good double action airbrush costs around $100 to $150, but you can use the compressed air from your blasting system to power it. With both, the use of spray paints and/or an airbrush, you need to re-mask some of your project areas to keep from over-spraying those that already have the coloration you want. You can mask off with masking tape or Frisket. Frisket is clear in color, thin and easy to cut, and has a low-tack adhesive on it so as to not damage painted areas that it is applied to. PAINT RECOMMENDATIONS: STONE Everything covered so far also applies to stone projects with the exception of items that will be placed outside, such as monuments, stone plaques, or bricks for walkways. When choosing your paint for this application, you have to consider the exposure to all sorts of weather as well as being exposed to UV light on a much greater scale than any of the projects we have covered so far. Regular spray paints, such as lacquers or enamels, can be used as long as they state that they are for outdoor use. I would, however, not overrate the longevity of these paints to your customer. Used on outdoor projects, I would guess-timate the life expectancy of these paints to be six to 10 years, depending on where you live. Here in New Mexico at our altitude and high UV radiation, I estimate more on the short time than not. For longer lon- An example of a surface-carved image with airbrushed details. Opaque paints were used on these dark green bottles. Transparent paints won't do on dark glass. Metallic paints applied to deep-carved images. A deep-carved mirror from the back with transparent paint airbrushed into the carved areas. 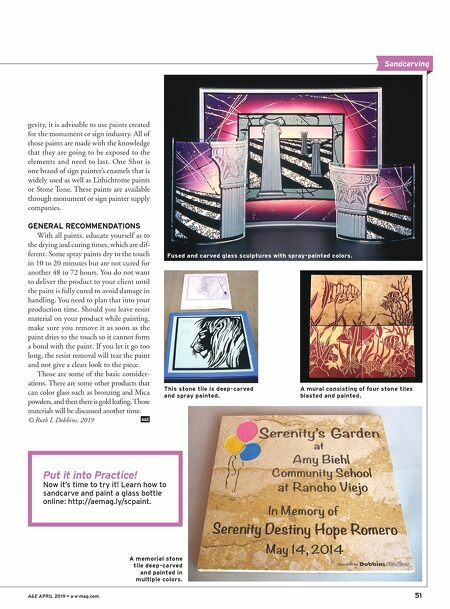 The piece is back lit to make the etched and carved images glow and look like they float.